Chorioretinal atrophy (CR) is the result of loss of the choriocapillaris, Retinal Pigment Epithelium (RPE), and the outer layers of the sensory retina. This may be due to loss of circulation from the choriocapillaris or from an inflammatory event. The result is a “window view” of the choroid and sometimes the sclera. 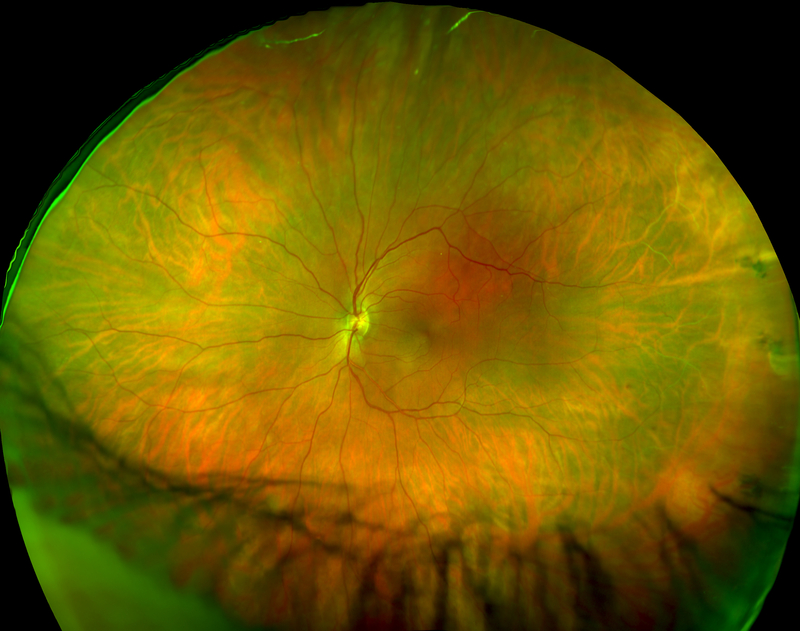 There is often pigment clumping in and around the lesion due to migration of the degenerated RPE cells into the inner retinal layers and sometimes, there may be pigment cuffing of a vein crossing the lesion. 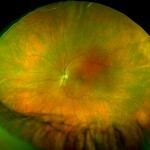 If the fundus lesion allows a clearer view of the choroid, it is likely to be CR atrophy. In the posterior pole, the view is of choroid but in the periphery where there is usually much less choroidal vessels and melanocytes, the sclera is often seen. At times, this may have a light yellow color to the lesion. If it occurs in the macula, it is called geographic atrophy.